The German project "Küstennahe Stoff- und Energieflüsse - der Übergang Land-Meer in der südöstlichen Nordsee (KUSTOS)" aims at the analysis and quantification of matter and energy fluxes from land through the German Bight into the shelf water. A three-dimensional advection-diffusion-reaction model was developed in the working group KUSTOS G2. The first task was to simulate the horizontal and vertical concentrations of the main variables of the pelagic plankton system in the North Sea. The second step after model validation was to calculate the primary production in this area under realistic forcing. The advection-diffusion-reaction model uses the hydrographical flow field from POHLMANN (1996) for calculating the transport processes of the biological variables. Nutrient regeneration occurred in the pelagic and through a simple parameterization at the bottom via a benthic detritus pool. Solar radiation was calculated every 30 minutes for each grid point by an octa-model using daily cloud data. The under water light is modified by self-shading of the phytoplankton. Primary production is limited in the model by solar radiation, the triggering nutrient phosphate and zooplankton grazing due to prescribed monthly mean copepod biomass. The animation of the simulation presents surface concentrations of phytoplankton, phosphate and the daily cumulative primary production of the North Sea. The model results presented are part of a comprehensive simulation for the year 1986 (Moll 1995). 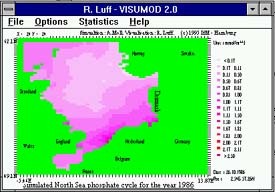 The project KUSTOS was financed by the Bundesministerium für Bildung, Wissenschaft, Forschung und Technologie (BMBF) between 1994 and 1996. Moll, A. (1995) Regionale Differenzierung der Primärproduktion in der Nordsee, Berichte aus dem Zentrum für Meeres- und Klimaforschung, Reihe B, Nr. 19.